I thought I had all ingredients and everything I needed to cook this dish… but so often I find that one or two things are missing. Does it happen to you too? I hate it! I hate unexpected changes… This time I looked for my kitchen silver paper and… there was none left!!! Aaaaaahhh, ok everything has a solution and my “smart” solution, this time, was to cook the dish without the silver paper! Ha! Ingredients for 4 servings: 4 eggplants or aubergines, 200 grs. of pasta (smaller sizes are preferable), 1/2 kilo of red tomatoes (aprox. 4), 1 garlic clove, olive oil, 4 anchovies in salt fillets, 50 grs of black olives without their seed, 1 teaspoon of hot red paprika, a spring of fresh parsley and salt. Cut the hat of the eggplants and empty their pulp, cut in small dices and reserve in a strainer, sprinkle some salt over so that it leaves the sower juices away. Pour a bit of oil on the eggplant shells and rub all over as well as some inside and some salt. Turn oven on at 170ºC. Place the eggplants shells with their hats on in the middle rack and with silver kitchen paper on them. Have for 30 minutes. Meanwhile, take a sauce pan and pour some olive oil (5-6 tablespoons), medium heat and add the eggplant dices (they should have lost their sower juice after 30 minutes). Stir and add the tomatoes in small dices too. Stir for 5 minutes and add the hot paprika. Stir another 5 minutes at medium heat. Boil some salty water in a pot and pour your pasta. Follow package instructions and drain. Refresh with tap cold water and add some oil so that it doesn’t stick together. Back to the sauce pan, when you see the eggplant is done add the anchovies thinnely sliced and the black olives cut in circumferences. Stir for only 30 seconds. Add the pasta. Turn heat off. Chop the parsley and add it too. Keep on stirring until flavours and ingredients mix well. 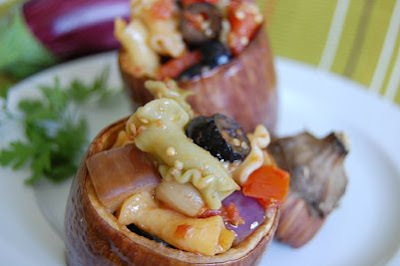 Fill the eggplants’ shells and back to the oven for 10 minutes at 220ºC. 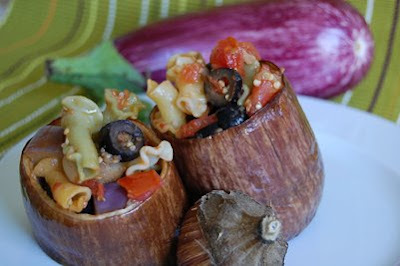 Hola chica…how novel of an idea…stuffin eggplants with pasta and veggies! I love these eggplants…sweet and never bitter. It does look wonderful, even with your set backs. Thanks for sharing with Presto Pasta Nights. Purple aubergines are beautiful Nuria and how delightful to see them stuffed with pasta, anchovies and olives! Great taste for sure!….bonito! They look like little gifts! What a great idea. so I think I will either grill the eggplant shell seasoned wrapped in Aluminum foil on the stove top. I love this type of eggplants, never buy the other big ones as they are bitter and absorb too much oil. Lovely idea to stuff them with pasta and anchovies. Nuria, I have tagged you. Great idea, Nuria! Thanks for the sweet words you left on my blog. coucou! Ahhhhhhhhh the Paella was ex-ce-lent we twisted it a bit–but while we were making our shopping list i was reading off the list of ingredients from your recipe! i’ll put a picture of it up, eh, tomorrow. well, MY tomorrow. 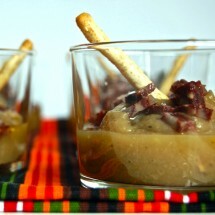 We’re on different time zones now….i hate time zones…..
Nuria, this looks fantastic. I just know I would love this dish. The ingredients make me happy. Olé, olé, olé!!!! Great job Mallory!!! Aaaahh, I’m so happy you enjoyed it :D. Can’t wait to go to your blog and see how it came out :D. Thanks so much for your confidence in my recipe!!! If you are happy… I’m happy :D, Giz! Wow, those are REALLY scooped out and stuffed! I have never seen stuffed eggplants quite like that. Want to eat! Want to eat! Hey Peko Peko! Same thing as with Peppers but changing the veggie and the stuffing… I guess rice instead of pasta would have been good too! 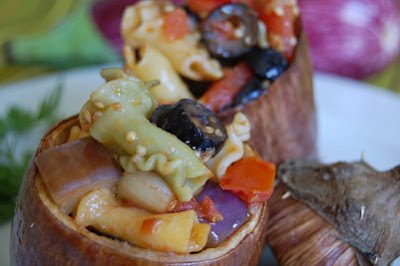 I adore eggplant and pasta but hadn’t thought of putting pasta inside eggplant. Brilliant! I wonder if there’s a way to help preserve that gorgeous purple color. I know with purple potatoes, if you boil them with some vinegar it helps retain the color.